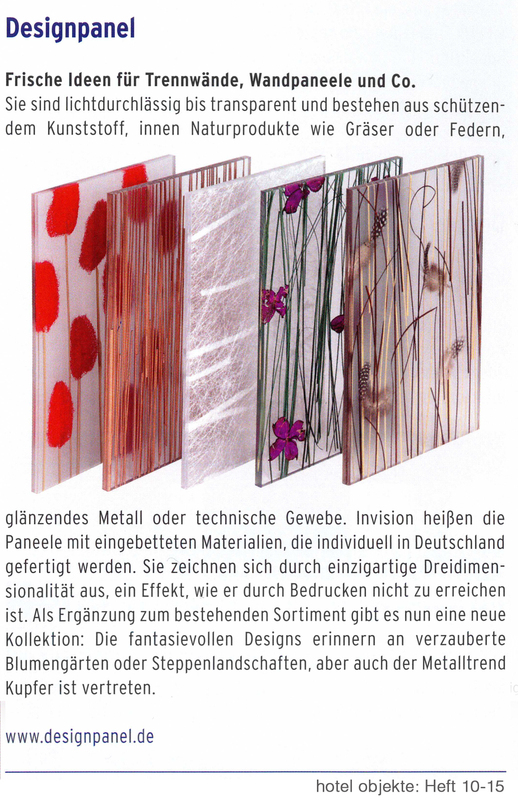 - Zoom on article "Panels, with nature inside"
Always in great demand: our look-book DESIGNPANEL PROJECTS. Unfortunately it is out of print for quite some time. Lightpanels at the EXPO Milano 2015. Until the end of October 2015, Milan will host the largest world exhibition with the theme “Feeding the Planet, Energy for Life”. In keeping with the theme of Expo Milano 2015 the pavilions participants allow visitors to interact and learn more about topics from the global significance. In the exhibition rooms of the Swiss Pavilon Lightpanels, integrated in the information panels were used to illuminate photos and graphics. About forty of them in different dimensions guide the visitors through the exhibition. Ministers of Qatar visit a health centre equipped with our product INVISION stem. Designpanel presented itself at „Project Qatar 2015“ - one of the Middle East region’s leading building and construction industry events, held in Doha. The international trade exhibition for construction technology, building materials, equipment & environmental technology took place from 4. to 7. May 2015 at the Qatar National Convention Centre in Doha. More than 2.000 leading firms and brands were represented this year across 41,500 sqm of indoor and outdoor exhibition space. Building on 11 years of history, Project Qatar has become the largest construction exhibition in the country, and remains a gateway to the region. Having attracted a wide variety of exhibitors and visitors from across the world, Project Qatar showcased state-of-the-art technology and provided insight into industry trends this year. Project Qatar’s enhanced Business to Business (B2B) matchmaking platform enabled visitors to meet with companies, so to share best practices, explore the latest technology, and pursue business deals. Local key buyers and industry leaders informed themselves about the most up-to-date materials available on the market. Project Qatar offered a unique opportunity for both exhibitors and buyers to learn about new solutions, to network and to explore new ventures for the future. In cooperation with its distributor in Middle East, the Coastal Trading and Engineering Company Qatar, Designpanel occured for the first time as an exhibitor. Both core product groups, solide surface materials and lightpanels, were presented. Designpanel met with a lot of interest and had enlightening contacts with architects, construction groups, project developers, as well as representatives of authorities. to the article: - "Lichtboden auf zwei Ebenen"
to the article: - "Erleuchtung"
Floating on light - our newly developed LED lounge chair is truly a highlight at any pool. The reduced form, the almost invisible material and the trend-setting lighting technology - a cordless, snap-on LED light rail - is the secret. Designpanel and its New Product LIMA at the ZOW - a Successful Trade Fair Presentation which Positive Received Feedback Throughout. The nineteenth international fair for suppliers to the furniture and interior design industries - ZOW took place at Bad Salzuflen from 18 - 21 February 2013. For the first time Designpanel GmbH participated as exhibitor. Samples of the complete product range were presented whereby the focus was on the presentation of our new product LIMA - a system for walls and niches. To see the articles please click on the pictures. The luxurious caravans by Niesmann + Bischoff, recently presented at the CARAVAN SALON Düsseldorf, as of now are available equipped with Lightpanels plus Invision on request. A concept study by Rinspeed presents Invision weed green as transparent car roof at this year's Geneva motor show. In 2012 Nuremberg focused on Albrecht Dürer who was not only one of the city's most famous sons but also one of Germany's most important painters. Commensurate with the occasion, the city renovated Albrecht Dürer's house where he created his greatest works of art. This renovation included the remodelling of the entrance area of the house where the painting "Masters of Dürer's Time" by Friedrich Wilhelm Wanderer introduces the visitors to Nuremberg's golden age and shows Dürer among his most famous contemporaries. The painting was digitally printed on Lightpanel frameless and softly illuminates the room. Cool white LEDs make the painting'' colours brilliant and pristine. The second "Triennial" took place at the Kunsthalle Schweinfurt with many Nuremberg artists participating. Among them the artist Christian Höhn who presents his works on Lightpanel frameless. During the international sculpture festival "Arte En Concreto" at Guatemala, works of art combining concrete with light panels, light fibres and plexiglas® were created under the aegis of the renowned Erlangen artist Dieter Erhard. The small light areas or delicate plastic elements form a fascinating contrast to the heaviness of the building material. The sculptures touch the beholder by their gracefulness. An example of the various application possibilities of Lightpanels and translucent plastics. A New Record for the Light + Building 2012 – The World' s Leading Trade Fair for Lighting and Building Technology: About 196,000 Visitors Came to Frankfurt to Obtain Information About the Latest Trends. One of the main attractions was the OSRAM stand in the festival hall with a size of more than 2000 square meters which surprised the visitors with a gigantic light sculpture this year. The highlight of the OSRAM stand, the so-called "OLED Globe“ was made by our Nuremberg partner company Axis just like all other light exhibits at the stand. Axis was also responsible for the realisation of the planning which was accomplished by the company's in-house engineering department. Haute Cuisine by star chef Peter Maria Schnurr –presented on innovative products made by Designpanel. We were quite thrilled when we first heard that Lightpanel iso is among the winners of the iF material design award 2012. The joy was even greater when we were informed that our product had been selected to receive the gold award! On Friday, February 10th the time had finally come: The award ceremony and presentation of the gold cup to our designer team Frank H. Weimer and Rüdiger Szak took place in the festive atmosphere of the BMW World at Munich. The presentation of the iF gold award was celebrated by about 1,600 guests. With the presentation of the iF gold award, topping all iF competitions, the iF design awards night was the design event at the beginning of the year. At the invitation of iF International Forum Design, the award winners and guests of an economic, cultural and political background celebrated their success in one of the most famous design competitions. Frauke Ludowig hosted the event and iF managing director Ralph Wiegmann presented the golden trophy, designed by Herbert H. Schultes, to our winning team! 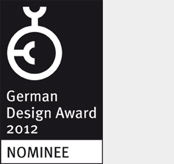 The very best in design deserves the best in prizes, to be more precise, the 2012 German Design Award. It is bestowed annually for outstanding achievements in product and communication design by the German Design Council. Personalities from the world of design are also honored. There is also a cash prize for young designers. The 2012 German Design Award is the award of awards and the award of award-winners. A reward for outstanding work. Only works that are both pioneering and marketable, and indeed have already proved that they are fit for market, are short-listed. The competition aims to identify, present, and reward innovative and international design trends. In other words, design that differentiates. In this light, participating is something for the crème de la crème. Winning too. Congratulations to our partner, the Ikaros Team of the University of Rosenheim, for capturing an exceptional second place in the competition! During the competition, which was held at Madrid this year, 20 international school and university teams competed against each other to determine who can design and build the most attractive and energy-efficient solar house. On June 27th, the moment had finally arrived: Rosenheim won first place in the categories lighting, comfort, energy balance and appliance – and missed taking first place by less than one point! Designpanel was involved in the project with two products:We contributed the two interior sliding doors made out of ICEPLEX “ice white” to the Rosenheim solar house and the bathroom was equipped with wall panels made from IVISION “stem”. Highest design and product quality was our goal when we developed both our innovative product lines – and presented them to an international jury. And we were successful! During this year’s iF material award we made a double score: We received this much sought-after award in the category “Material” for our surface product “Wavepanel” and in the category “Products” for our custom-made LED light emitting surface “Lightpanel”.